Titanium and Niobium Simple and Classy Hook Earrings at Wear Earrings Again with Maggie's Creations - Non-allergenic Earrings, guaranteed! See my CHANGE-ABLES page if you would like to order a different hook than the pair shown with these earrings. NOTE: It may take some time to aquire the supplies needed to make these "custom made to order" earrings for you. Please read my GUARANTEES & POLICIES page for more information. 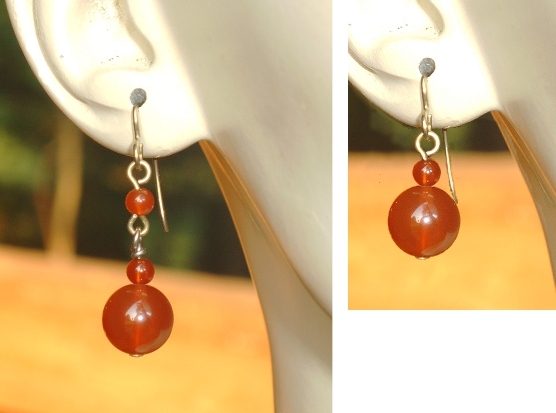 Top Quality Genuine Carnelian on All Niobium (Nb) or Titanium (Ti) Metallic Elements! Just look at the color and quality of these beauties. Available in natural gray/silver-tone Titanium or Niobium, or anodized golden Niobium, your choice. Choose long or short designs. Long earrings hang @ 1.75 inches from the piercings and short earrings hang about 1.25 inch from the piercings. Perfect for the Brown, Rust, and Copper fall color wordrobe! Top Quality FWC Light Blue/Gray Peacock Oval Pearl Earrings! Earrings hang about 1 inch from the piercings. All Niobium (Nb) or Titanium (Ti) hooks and wire work in natural gray/silver-tone or anodized golden tones (your choice)! 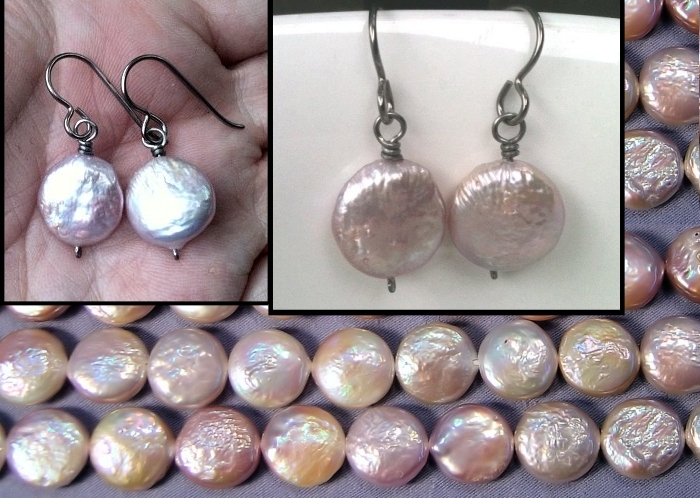 Top Quality FWC Great Big Beautiful Pink Coin Pearl Earrings! Earrings hang about 1 inch from the piercings. Your choice of All Niobium (Nb) or Titanium (Ti) hooks and wire work in unanodized (natural gray-silver-tone) or gold tones! Just look at the gorgeous Raspberry Red Color of these Lab Grown (chemically identical) Faceted Ruby Beads! They are the spot light of these beautiful and elegant earrings! Earrings are available with Sterling Silver or Gold Fill Wire Work and matching Titanium (Ti) or Niobium (Nb) hooks for your sensitive pierced ears. Two genuine Swarovski Crystals flank either side of the Ruby bead. These are a very special find. Very rare and much more beautiful in person than a picture can show. Click on picture for a detailed view. 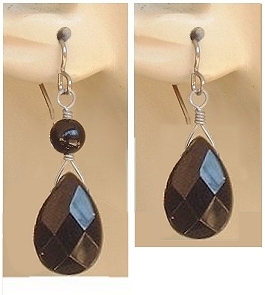 Beautiful 10x14mm Faceted Flat Onyx Teardrops hang from your choice of Niobium (Nb) or Titanium (Ti) Wirework and Hooks. Silver-tones or Gold-tones, your choice! Choose with or without additional Round Black Onyx Beads. Shorter version earrings hang @ 1+1/4 inch from the piercing, Longer version earrings hang @ 1+3/4 inch from the piercing. Just Beautiful. I get the most beautiful Lab Grown Gemstones the world has to offer! Absolutely exquisite. 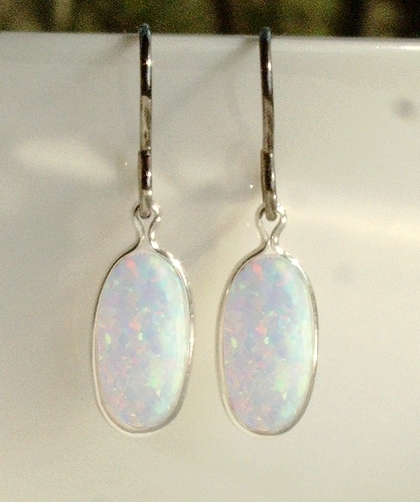 The brilliant color of these Lab Opals are what make the earrings so very special. Opals are set in a Sterling Silver Wrap Setting or Gold Fill Wrap Settings and dangle from Unanodized Titanium (Ti) or Niobium (Nb) hooks, with a Sterling Silver Accent bead OR Anodized Niobium (Nb) Hooks with Gold Fill to bring together the design. Earrings hang about @ 1+1/8 Inch from the piercing. Elegant. 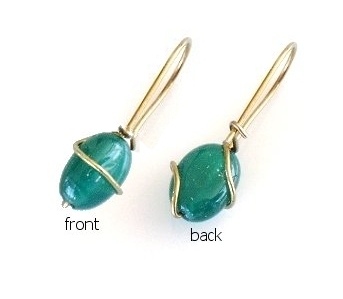 Gorgeous "Sea Glass" Drips dangle from your choice of Pewter or Brass beadcaps. Niobium (Nb) or Titanium (Ti) Shepards Hooks to match! 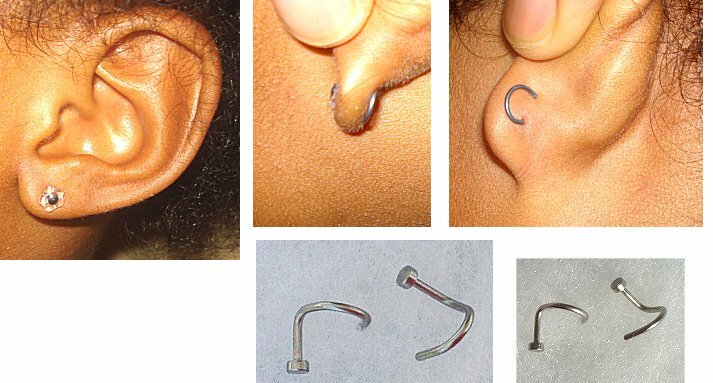 Earrings hang about 2+1/3 inch from piercing and are only 1/3 inch wide at the widest point. A beautiful eye catcher even for those with long hair. Many different styles of hooks are available for upgrade, for this earring on my "Change-able Hooks" page. Best for healed piercings and daytime wear. Elegant Simplicity. Perfect for that little black dress. Gorgeous faceted Black Onyx Gems dangle from your choice of Niobium (Nb) or Titanium (Ti) Shepards Hooks to match the Silver or Brass accent beads. Many different styles of hooks are available for this earring on my "Change-able Hooks" page. Best for healed piercings and daytime wear only. Pretty Glass "Iris" (purple and blue) Beads dangle from your choice of Niobium (Nb) or Titanium (Ti) Shepards Hooks to match. Silver or Brass accent beads and wire work compliment this simple design. 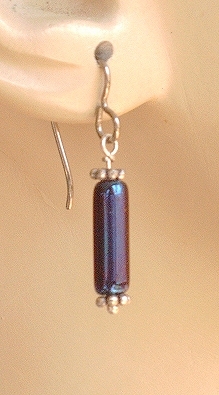 Many different styles of hooks are available for this earring on my "Change-able Hooks" page. Best for healed piercings and daytime wear only. Unusual Pewter Beadcaps top the Hematite Gemball, and all dangle from your choice of Niobium (Nb) or Titanium (Ti) Shepards Hooks to match. Many different styles of hooks are available for this earring on my "Change-able Hooks" page. Best for healed piercings and daytime wear only. 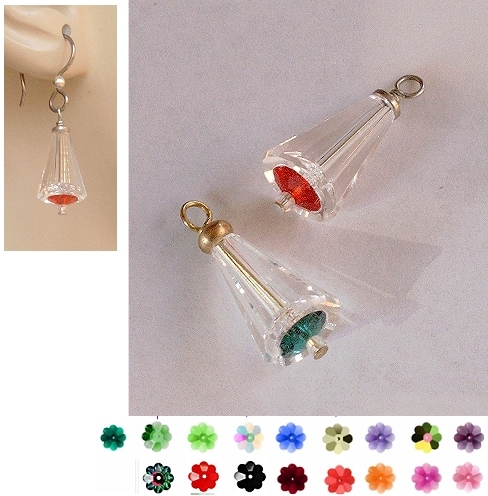 Crystal Bells in Genuine Swarovski Austrian Leaded Crystal. Like a fine cut diamond or leaded crystal vase, these "Crystal Bells" earrings are the "Belle of the Ball". Swarovski Crystal Margaritas in many beautiful available colors, accent the bottom of the earring's beautiful shape and design. "Christmas" color option will get you one red (light Siam) and one green (Emerald) to wear to your Christmas engagements. Earrings hang about 1+1/8 inch from the piercing. and come in Silver or Gold tones, and matching Titanium (Ti) or Niobium (Nb) hooks (your choice). Many different styles of hooks are also available on my "Change-able Hooks" page. Best for healed piercings only. 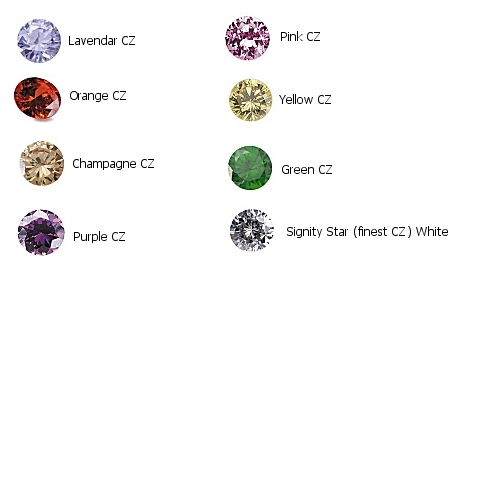 See Swarovski Crystals Color Chart in the left navigation bar for a full color chart, and let me know if your favorite is not shown in the color options below. Raspberry Lilac Keshi Pearls and Green Abalone Paua Shell Drop Earrings. 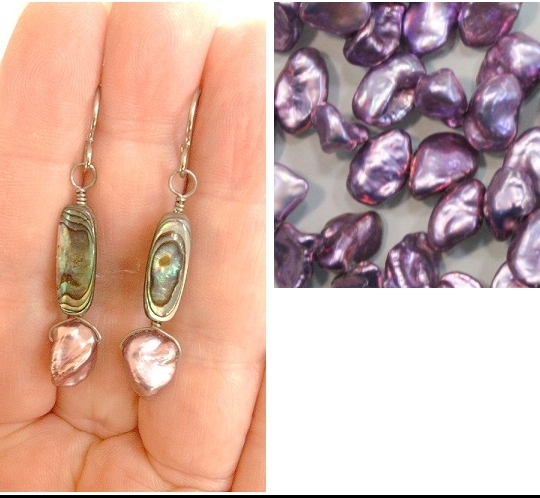 Gorgeous FWC Keshi Pearls (true color is shown on right of the picture) dangle from Abalone Paua Shell enlongated beads with your choice of Niobium (Nb) or Titanium (Ti) hooks, and wire work in Pewter/Silver-tone, Copper/Bronze-tone or Gold/Brass-tone metalics. Earrings hang @ 1+3/4 inch from the piercing. 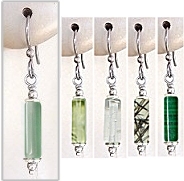 Many different styles of hooks are available for these earrings on my "Change-able Hooks" page. Beautiful! 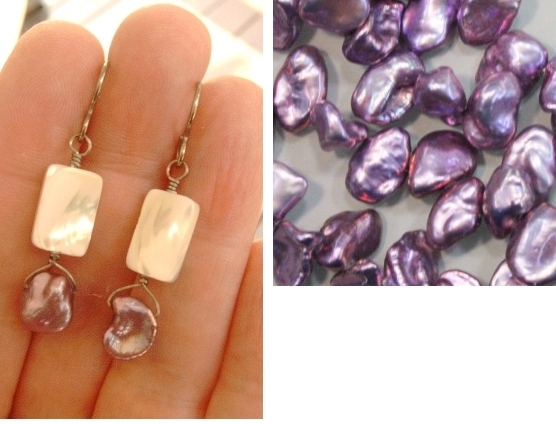 Raspberry Lilac Keshi Pearls and MOP Shell Drop Earrings. Gorgeous FWC Keshi Pearls (true color is shown on left of the picture) dangle from rectangle MOP Shell beads with your choice of Niobium (Nb) or Titanium (Ti) hooks, and wire work in Pewter/Silver-tone, Copper/Bronze-tone or Gold/Brass-tone metalics. Earrings hang @ 1+1/2 inch from the piercing. Many different styles of hooks are available for these earrings on my "Change-able Hooks" page. Beautiful! Gorgeous Faceted Amethyst Drops hang from your choice of Niobium (Nb) or Titanium (Ti) hooks, in Silver-tone or Gold-tone colors. Earrings hang @ 1+2/3 inch from the piercing. 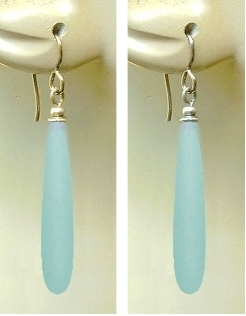 Many different styles of hooks are available for these earrings on my "Change-able Hooks" page. 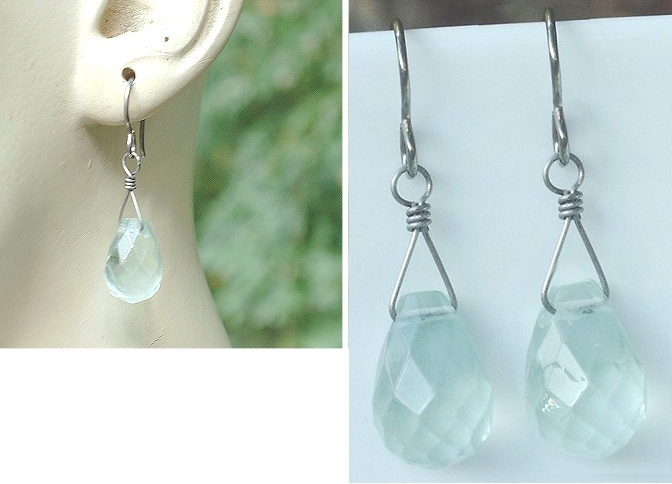 Stunning Fluorite Drops hang from your choice of Niobium (Nb) or Titanium (Ti) hooks, in Silver-tone or Gold-tone colors. Earrings hang @ 1+2/3 inch from the piercing. 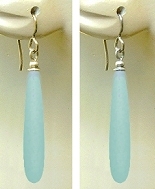 Many different styles of hooks are available for these earrings on my "Change-able Hooks" page. Genuine AA Grade Fresh Water Pearl Loop Cluster Earrings. Gorgeous tiny little Genuine FW Seed Pearls loop around to meet a larger genuine FW Pearl at the top. Earrings hang @ 1+1/4 inch from the piercing. Available hanging from your choice of Pure Titanium or Niobium hooks. 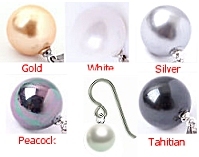 Gorgeous 8mm South Sea Shell Pearls (choice of white, gold, tahitian/black, silver or peacock) dangle from your color choice of hardware. Anodized golden Niobium hooks with Brass Bead Caps, Anodized bronze Niobium hooks with Copper Bead Caps, or Unanodized Niobium or Titanium with Pewter Bead Caps. Earrings hang just over 3/4 inch from the piercing. 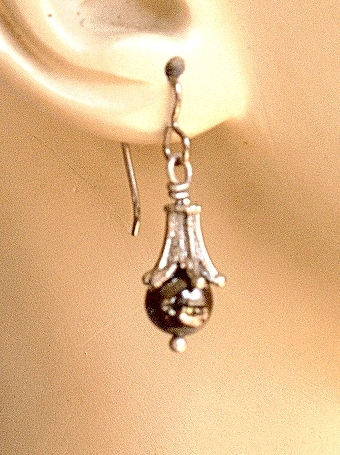 Shown on Titanium with Pewter Bead Caps. 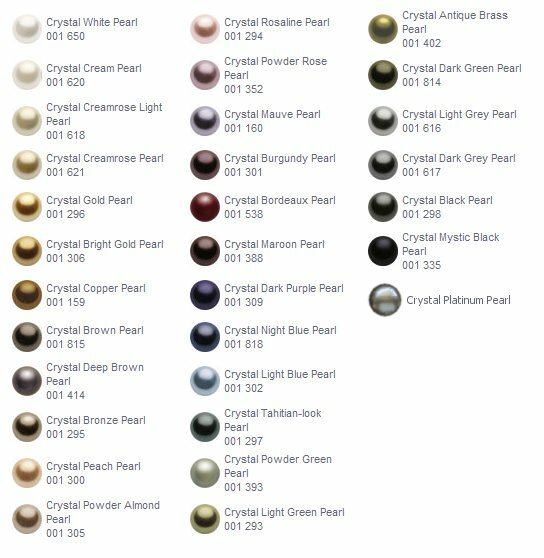 Be sure to see the larger detailed picture for Pearl Color Choices. Beautiful Green Turquoise Howlite Drops. Earrings hang just over 1+1/2 inch from the piercing and are about 1/3 inch wide at the widest point. Big and Beautiful! 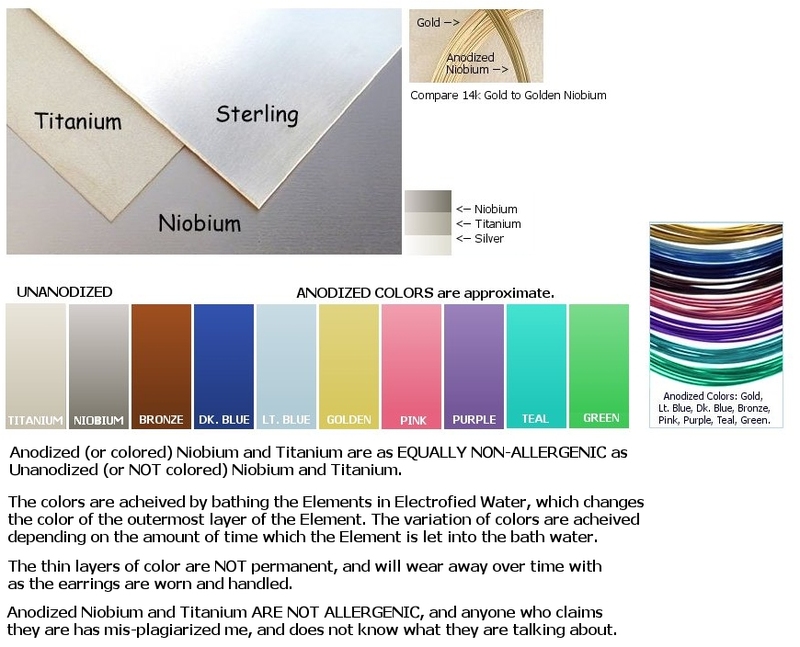 Your choice of silver-tone (silver/pewter/unanodized elements) with Niobium or Titanium OR gold-tone (brass/anodized golden elements) with Niobium hardware. Shown on golden Niobium. Be sure to see the larger detailed view. Ooo-la-la! I've got the very best Apitite Nuggets and Chips right now, which makes these earrings so special. The color is so beautiful and clean. Earrings hang about 1+1/8 inch from the piercing and are about a 1/4 inch wide at the widest point. Be sure to see the larger detailed view. 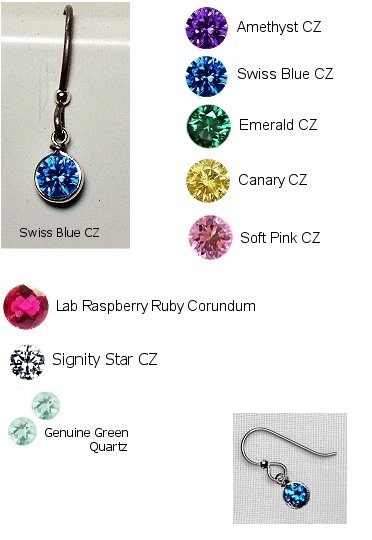 Beautiful Swarovski Crystal Bicones are top drilled and dangle from Sterling Silver Bead and Niobium or Titanium wire work and matching hooks. Lots of sparkle in these simple eye catchers! Earrings hang about 1+1/4 inch from the piercing. Be sure to see the larger detailed view. Exquisite Luster 10mm Drop Pearls are showcased on your choice of unanodized (silvertone) or anodized (golden) Niobium or unanodized Titanium hooks. This simple design really shows off these very special pearls. Earrings hang about 1+1/4 inch from the piercing and are about 10mm wide. Be sure to see the larger detailed view. Unanodized (Silver-tone) Titanium or Niobium hooks with Silver accent beads, or Anodized Golden Niobium Hooks with gold/brass accent beads. 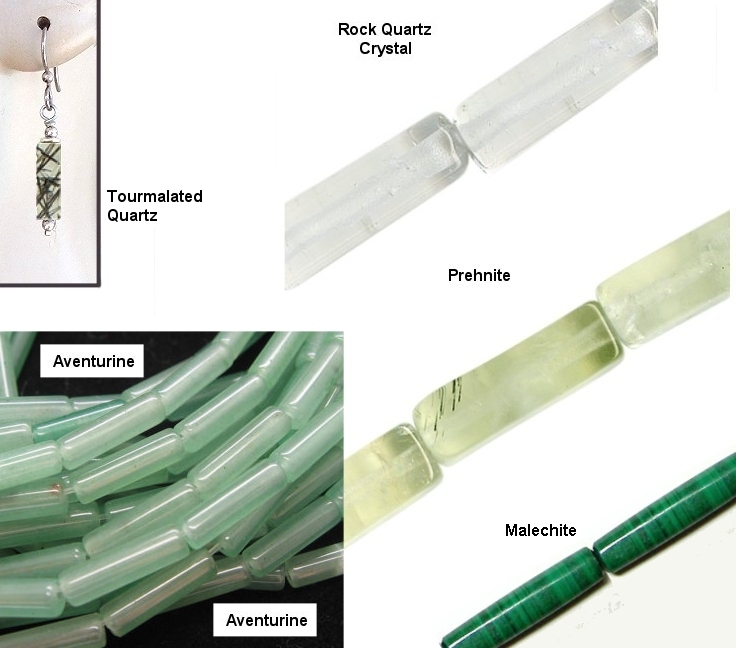 Available with Prehnite, Aventurine, Malachite, or Quartz Crystal Tube Beads. Very cool earrings. Earrings hang about 1+1/2 Inches from the piercing and are about 4mm wide. 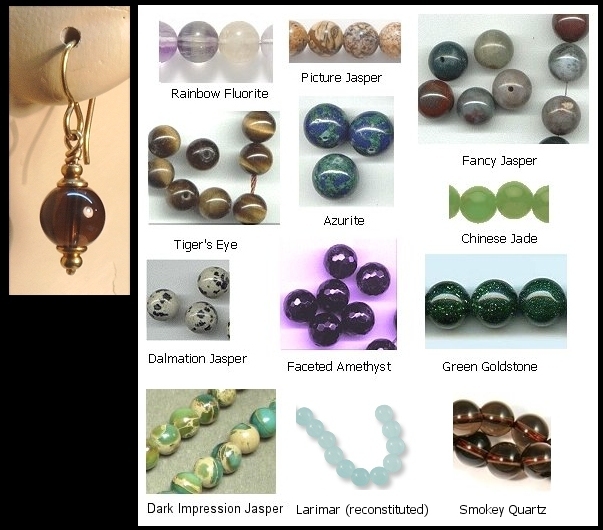 Click on picture to see Bead choices details..
Unanodized Titanium or Niobium with Black Onyx Gembeads in a drop design. Fantastic earring for blue jeans to evening gowns. Earrings hang about 1+3/4 Inches from the piercing. 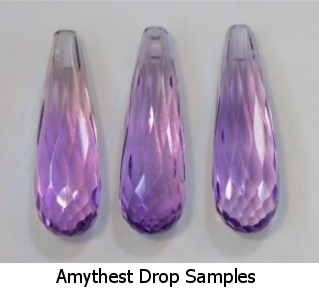 Actual drop bead will vary in shape and design. 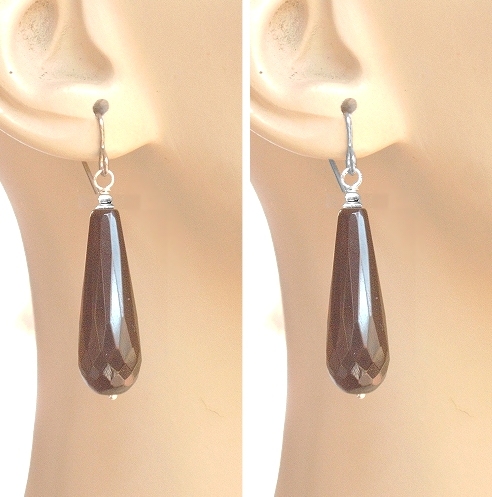 10x8mm or 10x7mm Pear Shaped Faceted Lab Grown Gemstone Earrings! These are available in Golden Nb and Gold Fill metalics for $15.00 upgrade. To get these in the gold option, choose Niobium (Nb) Settings, and tell me in the note section of the checkout page that you want Golden Pear Settings. 8mm Genuine Gem Ball Earrings! with your choice of Anodized gold Niobium (Nb) and Brass, Unanodized Titanium (Ti) and Pewter, Unanodized Niobium (Nb) and Pewter, or Anodized Bronze Niobium (Nb) and Copper wire work and beads. 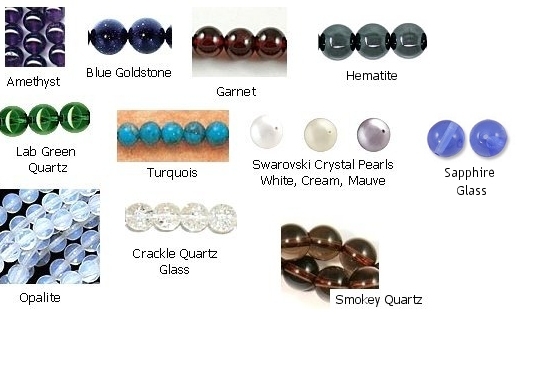 Beautiful Gemballs are available for this earring, click on picture to see Gemball choices. Shown with Anodized gold Niobium and Brass wire work and beads and featuring a Genuine Smokey Quartz Gemball. 5mm Lab Grown White Fire & Ice Opal Cabochons. Set in Silver wrap settings and dangling from Niobium or Titanium Kidney Hooks. Click on picture for a larger view. 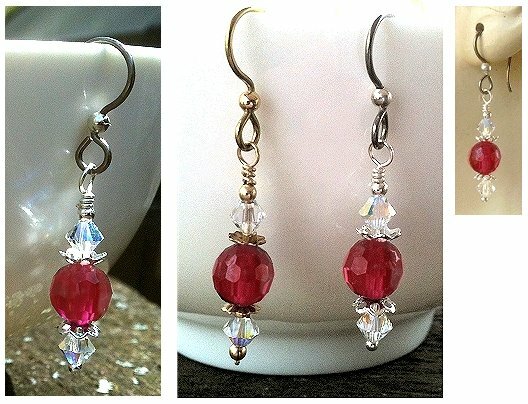 Glass & Crystal Bleeding Heart Earrings. Shown embelished with Silver on Unanodized Titanium or Niobium hooks. Also available in Coppertones with Anodized bronze Niobium hooks, or Brasstones with Anodized gold Niobium or hooks. Simple but beautiful. Hangs about 1+1/2 inch from piercing. Substantial size in beautiful Sterling Silver. Silver accent beads on the hooks pulls the look together. Choose Unandized (natural silver-gray color) Titanium (Ti) or Niobium (Nb) Hooks. Earrings hang @ 1 inch from the piercings. Available in White, Gold, Silver, Tahitian/Black or Peacock. Other colors available by request. Anodized golden Niobium Hooks or Unandized (silver-tone) Titanium or Niobium Hooks available. South Sea Shell Pearls are made of the actual shells that South Sea Pearls are cultivated from. They have the same weight, beauty and nacre of the real pearl at a fraction of the price. Perfect substantial 10mm size is simple and elegant. Gemball Drop Hoop Hook Earrings. Or choose any 6mm Gemball from my web-site. 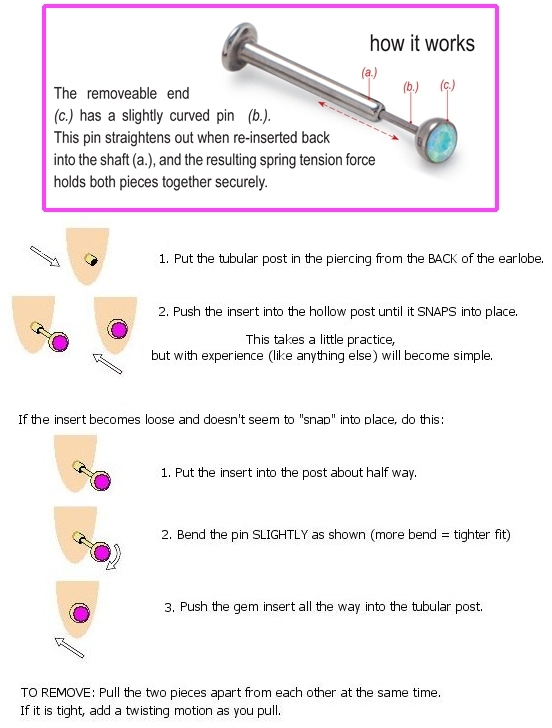 Click HERE to see some of my 6mm Gemballs. 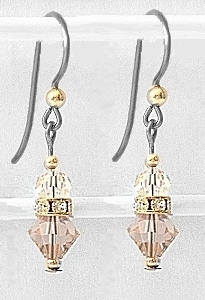 Accented with genuine Swarovski Crystals on Anodized gold Niobium, Unanodized Niobium or Titanium hooks. Simple, Beautiful, and Elegant. This "Hoop Hook" is not change-able, but can be added as an upgrade to any of my hook earrings for $5.00. Email me for more information. & Wire Work with 10mm, 8mm or 6mm Vintage Genuine Handmade Cloisonne' or Japanese Paper Wrapped Beads, available in White, Turquoise, and Metalic (shown). Earrings hang @ 1 inch from the piercings. Classic style earrings! Gold-tone beads are available with matching Golden Niobium (Nb) hooks and Silver-tone beads are available with matching Silver-tone Niobium (Nb) or Titnaium (Ti) hooks. 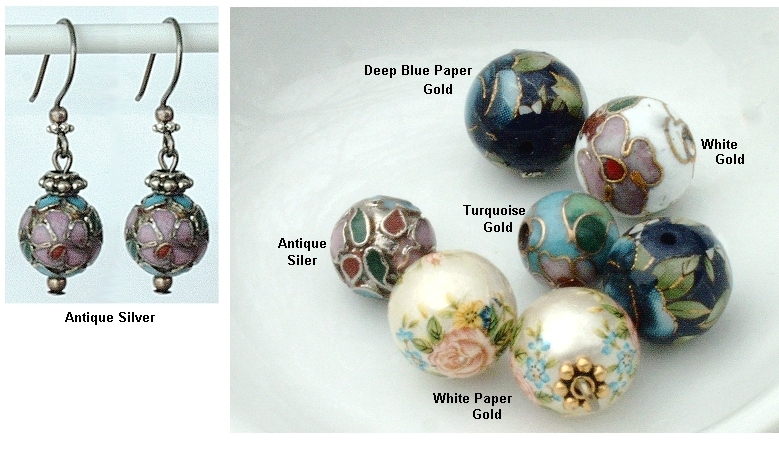 Click on picture for a larger view and details of the Cloisonne' Bead colors available. Anodized gold Niobium hooks and wire work, with brass beads or Unanodized Titanium or Niobium hooks with pewter/silver beads (your choice). Earrings hang @ 1 inch from the piercing. Beautiful! Available with Gold-tone or Silver-ton Metallics. Titanium (Ti) or Niobium (Nb) hooks allow us to wear this beautiful and classic style earring! Earrings hang about an inch from the piercings.